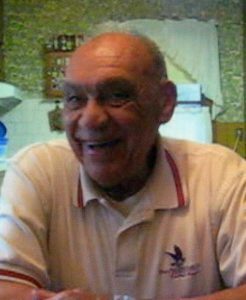 Home Obituaries Richard J. Andrade Sr.
Richard J. Andrade Sr. of Vineyard Haven died on Jan. 13, 2019, surrounded by his loving family. He was an Island native, where he and his three brothers, Arnold, Daniel, and Joseph (all pre­deceased him) were raised by their grandparents Joseph and Louise Fialho, also of Vineyard Haven. Richard was an avid sports fan. Growing up, he played baseball and later coached a Little League team. He loved his Red Sox, Patriots, Celtics, and Bruins, and traveled to Boston to see them all. In 1945, Richard served in the Merchant Marines, and he was sent to Antwerp, Belgium. On his return to the states he spent time in Clearwater, Fla., where he met his idol, Ted Williams. In 1948 he returned to Martha’s Vineyard and married his high school sweetheart, Martha Fay Brennan, and together they had seven children. In 1953 Richard began his career as the Prudential Insurance agent serving Martha’s Vineyard. He retired after 32 years, and spent his post-retirement years playing golf and working as a starter at Mink Meadows Golf Course. He loved hunting, fishing, and golfing. The notches on his golf bag included three holes in one. His door was always open to all (especially at four o’clock, happy hour), and you never knew who might show up for laughter and libations. Richard was an active member of St. Augustine’s Church in Vineyard Haven, and a member of the St. Vincent De Paul Society and the Redman Society. Richard was predeceased by his wife, Martha Fay Brennan; and by his children Terry Andrade and Richard Andrade Jr. He leaves his children Carol Andrade, Judy Martinek, Debbie J. Luce, Robert Andrade, and Thomas Andrade; eight grandchildren, Jesse Martinek, David Luce, Sarah Luce Motta, Tim Luce, Jocelyn Andrade Alexander, Derek Andrade, Zachary Andrade, and Benjamin Andrade; and two great-grandchildren, Jayden Luce and Mason Luce. A special thank-you to Debbie J. Luce, Bob Andrade, Connie Farina Andrade, and Sarah and Dyego Motta for their continued, loving care throughout these last years. Dad, after nearly 94 years, your body got tired, but your mind and sense of humor were with you until the end. Thank you! Your sense of humor and love were the greatest gifts of all! A visitation will be held Saturday, Jan. 19, at Chapman, Cole and Gleason, Edgartown Road, Oak Bluffs from 9:30 to 10:30 a.m. A graveside service will follow at Oak Grove Cemetery, State Road in Vineyard Haven, and then immediately following, everyone is invited to a celebration of life at the American Legion Hall in Vineyard Haven. Potluck dishes are welcome. Donations can be made to the American Legion, P.O. Box 196, Vineyard Haven, MA 02568 or St. Jude’s Hospital for Children, 510 St. Jude’s Place, Memphis, TN 38105, or stjude.org. Visit ccgfuneralhome.com for online guestbook and information.